Native to a very small area of south coastal Western Australia, the aesthetics of the red flowering gum have made it one of the most widely planted landscape and garden trees around the world in subtropical and tropical areas. 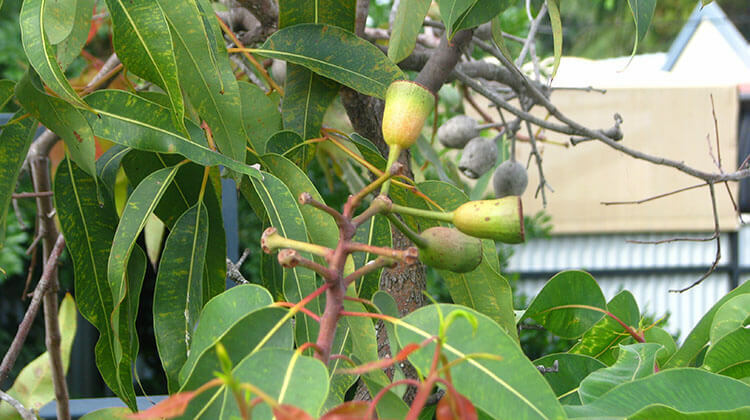 Despite its popularity, it’s not considered an endangered or threatened tree in Australia, nor is it an invasive pest in other areas beyond its native range. Well behaved, tough, and beautiful throughout the entire year, red flowering gum is a wonderful addition to any space, garden, or landscape. There are plenty of trees that are grown for their ornamental value and there are certainly favorites endemic to specific areas all over the world. The Midwest of the United States seems to be happily populated with flowering crab apples and lilacs. In many areas in Europe, flowering cherries and lindens are popular. In Japan, fancy-leaved Japanese maples are valued as much as cherries and plums and both hold significant meaning. Here in Australia, the red flowering gum, or Corymbia ficifolia is a much appreciated and ornamental staple tree that for many people holds significant nostalgic value. It’s a favorite of many. And in terms of popular ornamental trees around the world, the red flowering gum is a beauty unto itself with unique form and colour. Red Flowering Gum rarely reaches above 9 metres, and is considered a smaller tree. It can have a considerable spread depending on its form, some rounding out at over 5 metres. They can be multi-trunked but are often pruned early on and encouraged to grow a single trunk. The tree is short of trunk and has a large spreading thick canopy when young, and as it ages it tends to have an upside down broom-shape, with branches reaching up and out while still spreading wide. The texture of the branches and trunk are gnarled and unique, and thick in appearance. Grey in colour, the trunk itself is usually the shortest part of the tree. Large thick branches reach out early from the trunk of this tree. The base is usually wide and gnarled with a thick root structure at the base of the trunk sometimes visible in older specimens. The bark is messy looking and full of cracks and bumps. On older trees, moss and lichens adorn its bark. 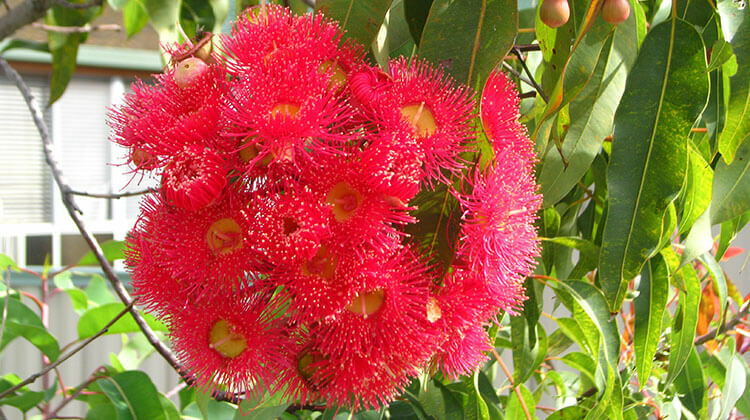 The most memorable part of the Red Flowering Gum is of course, its flowering. Most ornamental trees around the world bloom in whites and pinks. Red flowering gum blooms in the early summer instead in brilliant hot scarlet, red, and red-orange with chartreuse centers. Before blooming, pink buds are formed in clusters in heavy abundance. The open flowers have thin and fuzzy petals neatly ringing their chartreuse centers. The flowers are beautifully scented and very attractive to pollinators and wildlife. Truly evergreen technically, Red Flowering Gum does go through a yearly refresh of its foliage. The leaves have a silvery blue cast which is very attractive behind the bright hot red foliage. Leaves are lancolate and usually are matte in texture. Mature leaves are thick. Ficifolia is Latin for fig leaves, named for their questionable resemblance to Ficus species. The seed pods are brown and somewhat round or urn-shaped. The seed inside are winged and brown. They have among the largest gum nuts of any Corymbia/Eucalyptus species. Typically, red flowering gum is started from fully mature and ripe seed planted right away from the parent tree and is germinated readily. Sometimes grafted and layered, because it grows so quickly when young and starts easily from seed it’s usually propagated from seed. Red flowering gums grow well in any soil as long as it drains freely. In fact, it tends to be healthier in poor soils and nutrient deficient land. It prefers full sun exposure, but does fine against a building with some shade when young. And when this tree is young, it grows fast. Because of this, a good pruning routine is necessary early on to encourage red flowering gum trees to grow to their best form and potential, without risk of harm to itself or nearby structures. Generally, nursery grown stock is all grown with a single trunk from early on and this form should be encouraged as it matures. It’s not a tree that has destructive roots and does well around buildings and hardscape landscaping. It’s also tolerant of city life and does fine in urban gardens, parks, and roadsides. Some care should be taken to plant Red Flowering Gum trees in areas where their nuts, spent foliage, and flowers will make a mess. The nut is somewhat large and apparently people have been known to trip over them on the sidewalk. The flowers have copious amounts of sweet and sticky nectar in them which can make a sticky mess on vehicles and buildings. And while this tree is technically evergreen, it does shed older leaves yearly and therefore can be somewhat messy in that regard. Generally however, despite these seemingly downfalls to the very picky, red flowering gums are welcome and their messes are happily ignored or cleaned up without a lot of fuss. I’m from Geelong… One of my all time favorite tree grows in my backyard, my uncle grafted 2 red flower tree together and planted around 1967. The tree is massive over 12mts high and more than 12 mt wide, the trunk measured across over 1.8mts wide. My tree still standing, every late summer, flowers blooms attracting colourful native birds, bees, possums and fruit bats! It sounds beautiful, Ross. If I make it down your way I’d like to stop in. Nowadays most red flowering gum cultivars sold in nurseries are dwarf varieties. Hello David, thank you for your blog. Very useful information. I am looking to plant some more flowering gums on my property in northern Brisbane for bees (I am looking to start keeping bees). I read somewhere that bloodwood trees produce a nectar that ferments in the hive. Given that the flowering gum is a Coryimba genus, does that make it fall into the bloodwod category? Also, I have a very large flowering gum (a beautiful specimen tree) that produces a cream coloured flower, and it attracts millions of bees when in flower, so it obviously has significant nectar flow. Hello, thanks for this blog – so helpful. Do you know where I can source a grafted corymbia in Brisbane? Hi, I’ve just sighted a dwarf Corymbia red in Perth and wondering if it will grow in Hervey Bay and where I could source it in QLD. Hi Wendie. I know Neilson’s Native Nursery in Brisbane stock them. Sorry, I don’t know about freight to Hervey Bay. We have a red flowering gum on our nature strip in Burwood Melbourne. It has all the great attributes described, as well as the series of seed and leaf clean ups which can be a bit of a pain. It is a beautiful tree that brings the birds when in flower, and great shade in Summer. The trunk has been expanding for years so that at ground level, it is almost the width of the nature strip. Is this unique ? I have never seen another flowering gum with such a wide trunk. I think that’s pretty awesome, Malcolm. I would imagine your red flowering gum to be of quite an age. There are some very large, beautiful flowering gums along Jetty Rd in Rosebud. I live in Leongatha and we have a few large ones here too. In curiosity how well does this plant do in Brisbane region? I have read that it can have trouble on the east coast region due to humidity and is their particular cultivars that do well in this region. I did see it in a nursery recently but I didn’t think to check out what cultivar it was. Looks to me like a beautiful Western Australian plant sometimes jealous of some of their native flowering plants. I agree, I’m envious of WA flowering natives also. Most C. ficifolias, red flowering gums, sold through nurseries in Qld have been grafted onto C. maculata rootstock. It greatly helps their hardiness but we still don’t quite achieve the results of the tree in its native conditions. Like traveling via computer, lovely blog to find. One day I hope to travel to Australia and plan to do so in your spring and summer so I can look at all the plants. This tree is my favourite tree as well. There is one in our driveway and though not tall, rewards us with flowers in the autumn each year. The flowers are usually covered with native bees, which is a great thing. This West Australian native seems to do well here in Victoria.